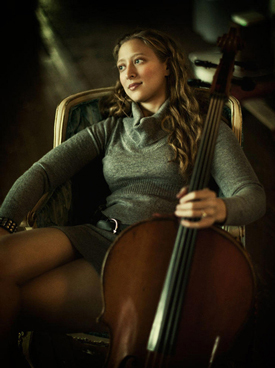 A Chicagoland native, cellist Jessie Reagen Mann is based in New York City and involved with a variety of musical projects. Most recently Jessie was honored to be accepted into the 1st Rising Song Fellowship with a cohort of exceptionally talented individuals. Jessie recently authored the cello version of 60 Seconds to Excellence. This left hand technique book is a series of short exercises to develop, maintain and remediate the accuracy of the left hand. 60 Seconds to Excellence will be presented at the IL IMEA convention in January, 2017. It is currently self published, but will also be available through Ovation Press soon! A lover of chamber music, Jessie a member of various ensembles. The Om Shalom Trio is an eclectic ensemble that blends traditional Indian Ragas and Jewish melodies in an inovative way. Their debut album "Quest" was released in late 2016. Jessie is co-creator of 2VC, a two cello project with Gene Carr that's dedicated to expanding the repertoire for 2 cellos. Jessie is also a musician at Congregation B’nai Jeshuran playing in both traditional and mindfulness services. Jessie co-composed the score for WAVES with colleagues Daphna Mor (recorders) and Pete List (beat box and shahi baaja) for Carolyn Dorfman Dance. "WAVES" premiered at NJPAC in March, 2015 and has since been performed all over the globe to critical acclaim. Jessie also composed the score for Carolyn Dorfman's solo work "Hourglass" which premiered in 2012. Jessie has performed with some amazing artists including Jay-Z, Beyoncé, Kanye West, Frank Ocean, Gaslight Anthem, Ra Ra Riot, Mike Errico, Enya, Gòn, the Yeah Yeah Yeahs, tap dancer Savion Glover, Natalie Merchant, Anat Cohen and Galeet Dardashti among others in various performances from Joe's Pub to the Met Ball. She was excited to be a part of Adele's November 2015 concert at Radio City Music Hall (NBC) and the Adele Live 2016 tour and can often be heard in various Broadway musicals. In May 2010, Jessie received the Outstanding Musical Achievement Award from the Max Reger Foundation of America. Later that month, she joined Beyoncé at the White House state dinner performing for President Barak & Michelle Obama and honorees Mexican President Felipe Calderon and First Lady Margarita Zavala. Jessie has recorded for Naxos American Classics, RCA Black Seal, Red Ink, Roc-A-Fella, Bridge, Domino, Anzic and Manifest Spirit Records as well as the Pioneers for a Cure project. Commonly seen on TV, Jessie has made appearances on LIVE with Kelly and Michael, Gossip Girls, SNL, TRL, The View, Late Show with David Letterman, Good Morning America, Today Show, Soundstage, Rockefeller Center Tree Lighting and the Martha Stewart Show. Jessie is currently on faculty at BIMA at Brandeis University and the United Nations International School in Manhattan.